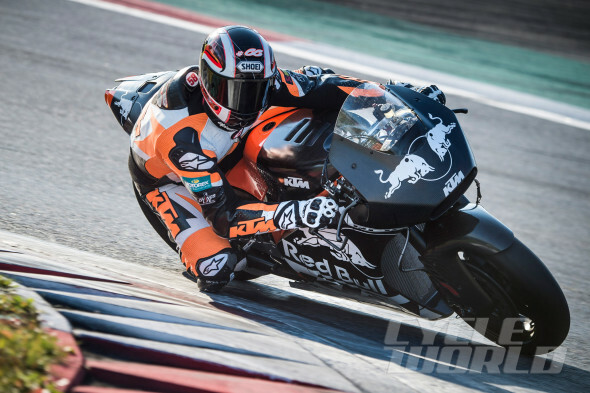 If you Google “KTM MotoGP bike,” you’ll quickly learn this new KTM has a 90-degree V-4 (hear the sound in the videos) and a steel-tube chassis with graceful bottom-braced aluminum swingarm. Everybody’s bottom-bracing these days because the rear shock and linkage have to move down to make room for an extension of the fuel tank under the seat. The front 60 percent of the RC16’s “tank” is a black carbon cover over the engine’s sealed intake airbox, fed through a generous-sized oval hole in the chin of the fairing. The rear part of the tank looks very Honda-like because its upper part, containing the far-back filler cap, is just a “conning-tower” that nicely fills the space between the airbox and the rider. Most of the fuel is lower down, closer to the machine/rider center of mass. With every passing year, race bike designers have less and less to do, as once pointed out by Ducati’s distinguished former race engineer, Filippo Preziosi. Bore is limited to 81mm so that is the commonly chosen number, with a 48.5mm stroke. If you’re making a V-4, might as well choose the 90-degree cylinder angle that can make the engine self-balancing without a shaker shaft. One Akrapovic exhaust exits from the seat tail, one from under the rider’s right foot, which says “V4” quite clearly. Fuel quantity will be whatever Dorna allows in 2017—maybe 22 liters, but subject to change without notice. Wheelbase, rake, and trail are pretty uniform among the brands, and everyone works hard to make the swingarm as long as possible. When you watch the video and listen to KTM’s engine pull away from a slow corner, you can hear just a trace of an occasional burble, which suggests the engine isn’t yet reaching for the last inch-ounce of torque. Historically, when teams decide they need more power, they extend valve overlap a bit, and you can usually hear this as a degree of gargling off the bottom. It’s a sure bet that another KTM has been thoroughly flogged on the dyno, hour after hour, to discover all the embarrassing stuff nobody wants to learn on the track—cracking of major castings, dark streaks on connecting rod bearing shells, instability in cam drives, oil accumulating in forbidden place(s). KTM, in its press release, emphasizes that this project is in-house. No Ilmor, no Cosworth, no “ghostwriters” mentioned. Full local control. How much power? Estimating a 16,000 rpm power peak (and assuming Dorna boss Carmele Ezpeleta doesn’t have a brainstorm as to how sell Honda on a restrictive Moto3-like rev limit before 2017), power will be in the vicinity of 240 to 245 hp. Photos show the entire opening in the fairing is filled top-to-bottom with radiator surface (with its middle taped for this test in cool conditions). But power (unless you don’t have the usual amount) has become irrelevant. Races are won by the total system (engine, suitably flexible chassis, rider, electronics) that exists to keep tires in best-possible condition, start-to-finish. 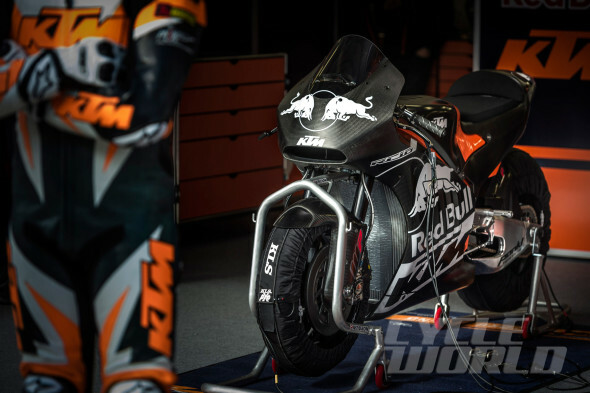 Very significantly, both sides and the nose of the RC16’s fairing are covered with the Red Bull message, and the three days of testing (“very many laps”) just completed took place at Austria’s Red Bull Ring track. Test rider was Alex Hoffmann, a veteran, and Mika Kallio has been signed for further testing this year. 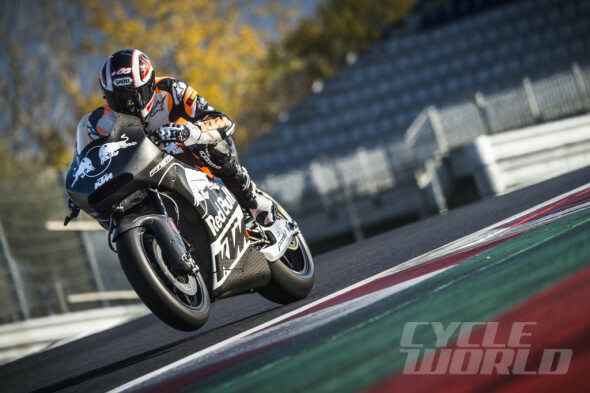 It is said that in 2017 KTM will also offer a customer version of this RC16 for track-day use. Price: 140,000 euros. That’s about $154,000.